The Express chatted with producer/director Amir Soltani. A still from the locally filmed doc Dogtown Redemption. The producer and co-director of documentary Dogtown Redemption is letting it all out. He’s passionate. He’s frustrated. He’s disappointed. Why? 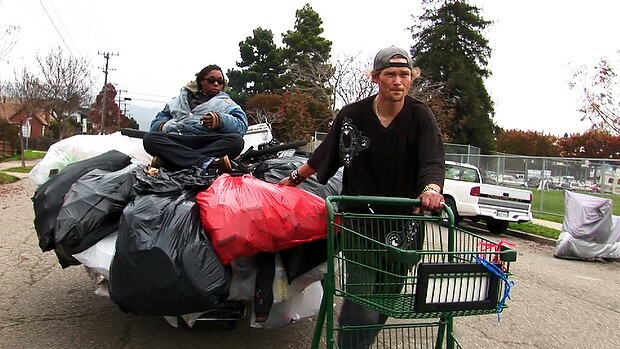 He made a film about poor recyclers in West Oakland, thousands of low-income or homeless people who shuttle shopping carts full of bottles and cans every day. These recyclers sell their finds off at Alliance Metals, a recycling center that’s been part of the west side fabric for decades, and earn a decent nut. But Alliance is scheduled to close in August, because of complaints about stolen recyclables and drug use in the surrounding neighborhood, which means thousands of people will lose their already meager income, the director says. That’s what Soltani hopes to accomplish during the coming weeks. He wants to talk about how we treat our poorest East Bay citizens, beginning with the first West Oakland screening of Dogtown this weekend. East Bay Express: When Alliance closes, hundreds of low-income and homeless recyclers will be displaced. Does the city have an obligation to ease their transition to a new center? What should the city be doing? I’m betting that we will not abandon or betray each other, that Oakland will rise not with rage, but with love. Are you hopeful that the city has solutions if Alliance does close? America’s not about equality anymore. It’s about status and security — standing one notch above, or on top of, the rest. Why wonder about who is drowning around us? Our boat is safely docked. No chance of us ending up camping in the tent cities springing up around us. As long as the value of our real estate is soaring, who cares if millions of Americans fall on the wrong side of interest rates and mortgage payments. If can’t keep up, you lose. You run out of time and head for obsolescence. And yes, sorry, you can no longer afford a sanctuary, the dignity of a place called home. Or a bond called family. It all begins to break down. Why is the conversation about homelessness not on the front burner in Oakland? Everything and everyone has a lobby. Toothpaste has lawyers. Toothbrushes have spokesmen. But poor people? Forget it. [Former mayor] Ron Dellums told me as much. When speech equals money, law equals even more money, then the casino moguls get the loudspeakers. The poor get a mute button. The city has harsh words for Alliance Metals and the recyclers. As for the law, the Oakland City Attorney not only calls [the recyclers] “thieves,” which is bad enough, but [also] incriminates them for making money. Why? [Because] they do drugs. In the park. Here is [their] logic: Take away the recycling, and you take away their money. Take away their money, and you take away their drugs. Take away the drugs and you can go for a stroll, and picnic in the park — a little chunk of nature for those who want some leisure. This is the American legal tradition at its worst. Its wobbly and weak. Detached from life. What is the lesson of Alliance as it applies to gentrification? Oakland’s changing. So is democracy. The City Council may grant you permits, licenses and zoning. You can begin and even build a business. For decades. But then the players change, the game changes and the rules change. And the next thing you know, the City unleashes its pit bulls. You start being fined. Thousands of dollars. And the message is simple: The City wants to change your business model. Sacrifice the shopping cart recyclers — 30 percent of your income — and the fines will stop. Fight, and you will have to spend 30 percent of your income on legal fees. Either way, you lose. Unless you’re Waste Management. The first West Oakland screening of Dogtown Redemption is this Saturday, June 18, at the West Oakland Youth Center (3233 Market Street, 3 p.m.). Producer/co-director Amir Soltani will discuss the film after the screening. Find out more at DogtownRedemption.